A school on Long Island has been renamed Barack Obama Elementary School in honor of his historic rise to the presidency. The move at the largely black and Hispanic school in Hempstead is among the first in what will likely be a wave of name changes around the world now that Mr. Obama has been elected president, from schools and streets to parks and mountaintops. The prime minister of the Caribbean nation of Antigua has said he's taking measures to have the island's highest mountain peak renamed Mount Obama. In Portland, Ore., students want to rename Clark K-8 At Binnsmead school. Elsewhere on Long Island, the Clear Stream Avenue School in Valley Stream will consider a renaming resolution in December. And parents already have been naming newborns Barack. "When I'm older I'm going to look back and say I went to Barack Obama Elementary School," said fifth-grader Teonte Jackson, who played Mr. Obama in a mock presidential debate before the election. "He had the guts to run for president and believe in himself." The name Barack Obama Elementary School was the idea of children at the former Ludlum Elementary School, according to officials at Hempstead Union Free School District. Mr. Obama's election was a big source of pride, and the schools walls are plastered with Obama signs. District officials believe it's the first school in the country to be named for America's first black president. Some of the children read essays about Mr. Obama and the election at the school board meeting on Thursday night, when officials voted for the change. "That really was effective," principal Jean Bligen said Friday. The essays were the culmination of a fifth-grade project that included a mock presidential and vice presidential debate. Just before the Nov. 4 election, the kids repeated the debate for parents and the public - followed by a mock election that Mr. Obama won by a landslide. 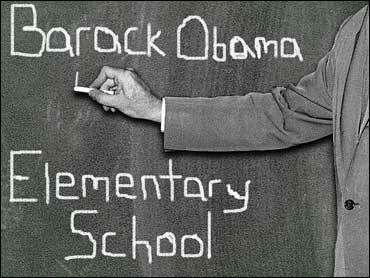 "After the debate, the children said, 'If Obama really is elected president, can we rename our school?"' said Joseph Laria, the district's superintendent. "It was so well done in terms of content and articulation that the school staff picked up the baton and made a presentation to the school board." The five-member board passed the resolution unanimously: "Whereas ... the students did a wonderful job of carrying out their tasks and demonstrating their patriotism at an early age ... now be it resolved that the (board members) proudly rename the Ludlum Elementary School as the Barack Obama Elementary School." The new name will appear on a sign in front of the building and on stationery, "hopefully before Christmas," at a cost of several thousand dollars to the district, Laria said. The change will be formalized at a ceremony sometime in December. School officials are hoping Gov. David Paterson can attend. The state's first black governor graduated from Hempstead High School. Hempstead is in Long Island's Nassau County, about 25 miles east of New York City.